WINNING! FFRF sues over school board prayer in Chino Valley, Calif. The Freedom From Religion Foundation filed suit on October 10, 2018, in D.C. district court challenging the preferential exemption of churches and related organizations from reporting the Form 990 annual information returns required of all other tax-exempt groups. Plaintiff is Nonbelief Relief. The defendant is David J. Kautter, acting IRS commissioner. Nonbelief Relief, a humanitarian group, was created by FFRF’s executive board in 2015 as a separate 501(c)(3) entity for atheists, agnostics and freethinkers to remediate conditions of human suffering and injustice on a global scale “whether the result of natural disasters, human actions or adherence to religious dogma.” That relief is not limited to but includes assistance to individuals targeted for nonbelief, secular activism or blasphemy. Representing FFRF in the suit is outside litigator Richard L. Bolton, with FFRF Attorneys Patrick Elliott and Sam Grover serving as co-counsel. The lawsuit was filed in the U.S. District Court for the District of Columbia. Case number 18-CV-2347. The case has been assigned to U.S. District Judge Timothy Kelly. 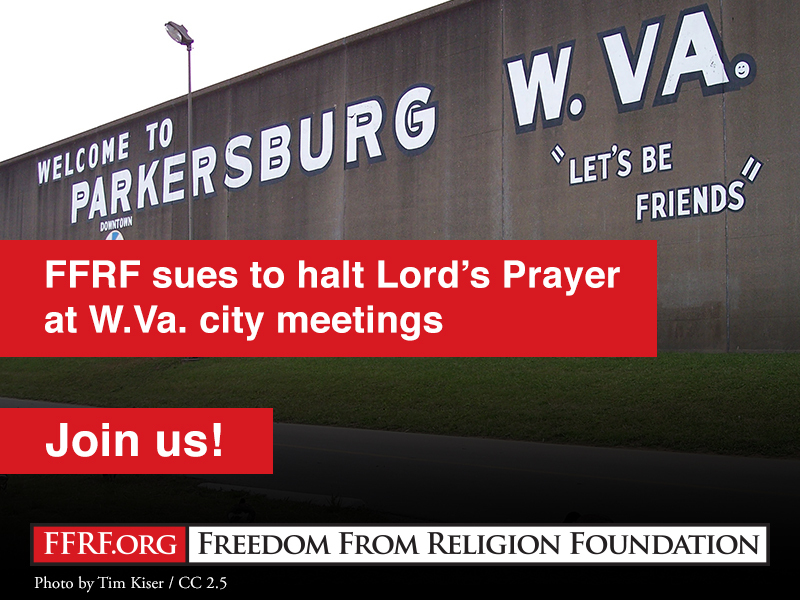 The Freedom From Religion Foundation and two local members filed suit on July 31, 2018, against the City of Parkersburg, W.Va., in a challenge to the City Council’s practice of reciting the “Lord’s Prayer” at each meeting. Parkersburg residents Eric Engle and Daryl Cobranchi assert in the case that their ability to participate in city meetings has been negatively impacted by the prayers. Council members and the majority of meeting attendees recite the Lord’s Prayer in unison at the beginning of the bi-monthly council meetings. At least one member of the City Council has been openly hostile to people who do not participate in the prayer. The plaintiffs also filed a motion for a preliminary injunction on July 31, 2018, which would prohibit the City Council from continuing to open its meetings with Christian prayers led by council members. The case (No. 2:18-cv-01198) is before Judge John T. Copenhaver, Jr., of the U.S. District Court for the Southern District of West Virginia. 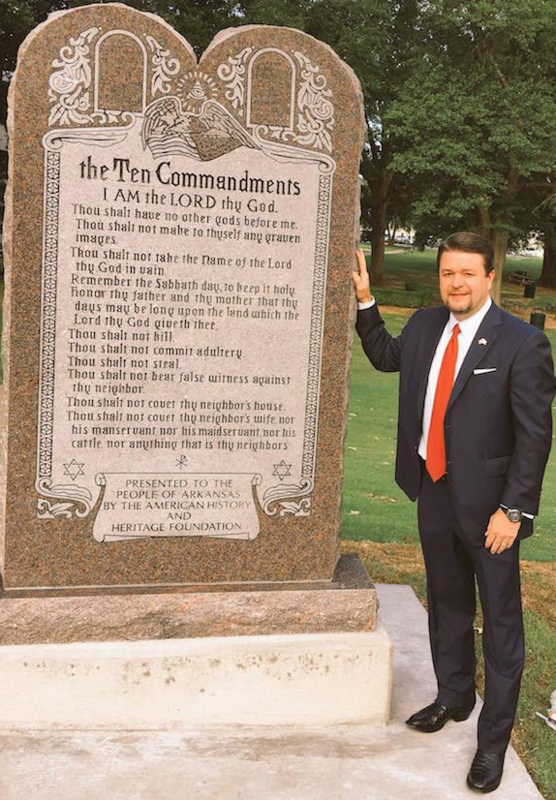 The Freedom From Religion Foundation and a coalition of plaintiffs filed a lawsuit on May 23, 2018, against Arkansas Secretary of State Mark Martin seeking the removal of a massive Ten Commandments structure from the grounds of the Arkansas Capitol. FFRF and its co-plaintiffs assert that this installation is in clear violation of constitutional precepts. The plaintiffs include FFRF, the American Humanist Association, the Arkansas Society of Freethinkers, as well as seven individual plaintiffs who are religious and nonreligious citizens of Arkansas. The suit details how the Arkansas Legislature initiated this unconstitutional move. The plaintiffs seek a declaration that the monument is unconstitutional, an injunction directing the defendant to remove the monument, and costs and attorneys’ fees. The lawsuit was consolidated with a case brought by the ACLU of Arkansas. The conjoined cases (No. 4:18-cv-00342) are before Judge Kristine G. Baker of the U.S. District Court for the Eastern District of Arkansas. Attorney Gerry Schulze is representing the plaintiffs along with FFRF Senior Counsel Patrick Elliott, and AHA attorneys Monica Miller and David Niose. FFRF is suing a Kentucky county jail for failing to comply with the Kentucky Open Records Act. On October 6, 2017, FFRF requested records from Laurel County Jailer Jamie Mosley related to a "Night of Prayer" held at Laurel County Correctional Center (LCCC) on August 29, 2017. During that event, Laurel County citizens and churches were invited to the jail to pray for inmates, their families, their victims, and jail staff. The jail erected a tent on the premises for the event where Christian ministers, community members, and staff gathered and a local church choir performed. Inmates were taken from their cells and escorted to the tent to interact with the crowd. The main event of the evening saw attendees locking hands and forming a "prayer chain" throughout every floor of the facility. FFRF sent four specific requests for LCCC's records related to the Night of Prayer and two specific requests for records related to substance abuse programming and religious programming. A few weeks later, Jailer Mosley provided a few responsive records, but stated that he was withholding the vast majority of the requested records based on a variety of exemptions set forth in Kentucky's state law, many of which were inapplicable and nonsensical. For example, claiming that turning over certain records would render the jail vulnerable to a terrorist attack, or that producing certain records would be overly burdensome while at the same time claiming that the jail is not in possession of the records at all. On November 17, 2017, FFRF asked the Kentucky Attorney General's Office to review the jail's response. On December 21, 2017, the Attorney General issued a formal opinion stating that the Jailer Mosley and the Laurel County Correctional Center had violated the Kentucky Open Records Act in their response. Jailer Mosley and LCCC had 30 days to appeal that opinion but did not. Kentucky statute therefore provides that the Attorney General's opinion has the force of law. FFRF has sued to enforce that opinion. FFRF is asking for an award of incurred costs, including reasonable attorney's fees. Additionally, it is requesting statutory penalties of up to $25 per day from the date of the request to the date of production for each document that the Laurel County Correctional Center is required to produce in this action. The case was filed in the Laurel County Circuit Court in London, KY. Michele Henry of CraigHenry PLC is handling the case on behalf of FFRF. 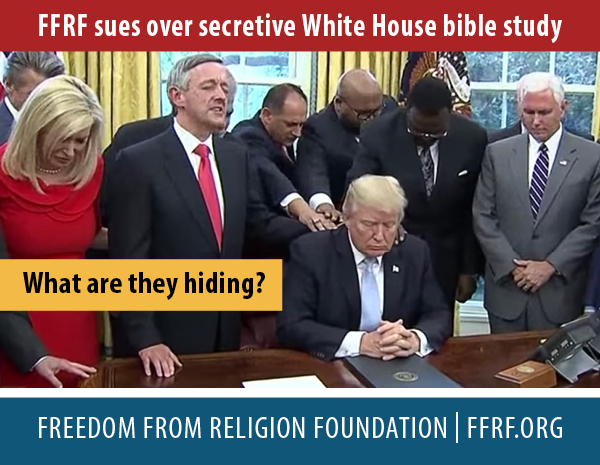 The Freedom From Religion Foundation filed suit against Secretary Ben Carson's Department of Housing and Urban Development for dodging records requests relating to a White House bible study. FFRF, a state/church watchdog, has teamed up with Citizens for Responsibility and Ethics in Washington, a government watchdog, to bring the federal suit. It was filed on Jan. 18, 2018 in the U.S. District Court for the District of Columbia. The lawsuit alleges that HUD has a pattern and practice of denying fee waivers on Freedom of Information Act requests "where disclosure of the requested documents is likely to cast the agency or HUD Secretary Ben Carson in a negative light." According to reports, the Trump administration holds weekly bible study sessions at the White House. FFRF is seeking the records to determine whether or not the bible study uses government resources, whether staffers may feel coerced into organizing or even participating in the religious event, and to ascertain government access granted to Capitol Ministries, a group that seeks to evangelize elected officials. HUD also denied FFRF a fee waiver on a second request, filed in October, over Carson's daily schedule and appearance at "Revive Us 2," an event at the new Museum of the Bible. HUD refused the wavier the day after the FOIA request and denied FFRF's appeal. CREW's fee waiver requests were also rejected. CREW sought a fee waiver and records, including emails, relating to the role Carson's son and wife play in HUD, where they are "omnipresent" fixtures. HUD denied another of CREW's waivers, this time for records relating to Carson's use of private planes to travel. The watchdogs are seeking the fee waivers they are due under the law, to enjoin HUD from unthinking, blanket denials of waivers, and attorneys' fees and costs. They ask that in the public interest, their requests be finally granted. The case (No. 1:18-cv-00114) is before U.S. District Judge Ketanji Brown Jackson. Anne Weismann, Chief FOIA Counsel for CREW, and Patrick Elliott, Senior Counsel for FFRF are representing the plaintiffs. FFRF filed a lawsuit against Justice of the Peace Wayne Mack on March 21, 2017, due to his refusal to end the practice of opening each of his court sessions with chaplain-led prayer. On January 22, 2018, Judge Ewing Werlein, Jr. denied Judge Mack and Montgomery County’s motions to dismiss, ruling that FFRF and two local plaintiffs—Jane Doe and John Roe, attorneys who regularly practice before Judge Mack—could proceed with their challenge to the prayer practice. Judge Mack has his courtroom bailiff announce the prayers and state that anyone may leave the courtroom and their case will not be affected, although the courtroom doors are locked to those outside. Then Judge Mack enters, talks about his chaplaincy program, introduces a chaplain, and gives the name and location of the chaplain's church. While everyone in the courtroom remains standing, the chaplain may give a short sermon, or move directly to a prayer. Attendees report Judge Mack surveying the courtroom during prayers and feeling that their cases may be affected by how they chose to react. The legal complaint asserts that due to his "considerable influence and power as a justice of the peace, Judge Mack exerts coercive influence over those in his courtroom, effectively compelling their participation in his religious practice." FFRF is seeking a judgment enjoining Mack from opening his court sessions with prayer and declaring his actions a violation of the Establishment Clause of the First Amendment. FFRF has filed an Expert Report, drafted by American legal historian and constitutional scholar Dr. Paul Finkelman, which details why Judge Mack's courtroom prayer practice is not historically supported. Montgomery County and Judge Mack filed a Motion for Judgment on the Pleadings on March 14, 2018. FFRF filed a response on April 11, 2018. The court entered a ruling on that motion on September 27, 2018, dismissing the lawsuit for lack of redressability, without reaching the merits of the constitutional claims. On October 25, 2018, FFRF filed a motion for reconsideration of that ruling, on the grounds that the decision violates the plain language of 42 U.S.C. § 1983. FFRF and the two local plaintiffs are being represented by FFRF Associate Counsel Sam Grover, with attorney Elizabeth Cavell serving as co-counsel. Attorney Patrick Luff of the Luff Law Firm in San Antonio, is serving as local counsel. Judge Ewing Werlein, Jr. is presiding over the case in the United States District Court for the Southern District of Texas, Houston Division. Freedom From Religion Foundation et al. v. Judge Wayne Mack and Montgomery County, Texas has case number 4:17-cv-881. FFRF filed a civil rights lawsuit against Mercer County Schools on January 18, 2017, over the school system's egregiously unconstitutional "Bible in the Schools" classes for elementary school students. Joining FFRF as primary plaintiffs in the case are Jane Doe, an atheist and member of FFRF, and her child, Jamie Doe. Elizabeth Deal and her daughter, Jessica Roe, joined the case on March 28, 2017. The bible instruction, taught by itinerant teachers who possess "a degree in Bible," began in first grade. Classes were held in 15 elementary schools, one intermediate school and three middle schools. The classes met weekly and lasted 30 minutes in elementary schools and 45 minutes in middle schools. The curriculum was equivalent to Sunday school instruction. Due to the lawsuit, the school system suspended the Bible in the Schools classes for the 2017-18 school year. On Nov. 14, 2017, Judge David Faber dismissed the case on jurisdictional grounds, finding that one family did not have standing and that the case was not yet “ripe” for review. Elizabeth Deal and Jessica Roe filed an appeal to the Fourth Circuit Court of Appeals (Case No. 17-2429). FFRF, the other two plaintiffs, and other Mercer County families could file a separate lawsuit should the school system resume bible classes. FFRF won a court victory before the 6th U.S. Circuit Court of Appeals ending similar bible instruction in Rhea County (Dayton), Tenn., schools in 2004. Marc Schneider is serving as primary litigating attorney and FFRF Senior Counsel Patrick Elliott is co-counsel. FFRF and the ACLU of Kentucky filed suit on November 22, 2016 on behalf of Ben Hart, who was denied a personalized license plate by the State of Kentucky. Hart's request for a personalized license plate reading "IM GOD" was rejected by Kentucky DMV officials who claimed the message was "obscene or vulgar," but then later said that it was because the plate was "not in good taste." The lawsuit challenges certain portions of the regulations governing personalized license plates as unlawful, namely those that allow government officials to deny plates based on vague notions of "good taste" as well as those barring personalized plates from communicating religious, anti-religious or political messages. Hart seeks approval of his license plate application, and a finding that certain provisions are invalid to the extent they allow government officials to deny personalized plates solely because they communicate messages about politics or religion. The case (No. 3:16-cv-00092) is before the U.S. District Court for the Eastern District of Kentucky. The Freedom From Religion Foundation and several of its local members filed suit on August 16, 2016, against Lehigh County, Penn., to remove a Latin cross from the official county seal and flag. The case was brought in the U.S. District Court for the Eastern District of Pennsylvania. FFRF is a plaintiff, as are members residing in the county who have encountered the religious symbol on governmental property and documents, such as on letterhead, numerous official county forms and reports, the county’s website, a display in the Board of Commissioners meeting room and even on flags prominently displayed at the entrance of county buildings. Joining FFRF in the suit are four county residents, Stephen Meholic, David Simpson, John Berry and Candace Winkler. By adopting and displaying a seal and flag with a Latin cross, the county is violating the First and 14th Amendments to the U.S. Constitution. The purpose is religious, not secular, and “has the primary effect of both advancing religion and expressing defendant’s preference for Christianity above all other religions and nonreligion,” the plaintiffs contend. FFRF and its co-plaintiffs are seeking a declaration that the religious symbols on the county seal and flag are unconstitutional, a permanent injunction against displaying them, nominal damages, costs and attorney fees. The litigation is being handled by Marcus B. Schneider of Pittsburgh, with assistance from FFRF Staff Attorneys Patrick Elliott and Liz Cavell. The case, 5:16-cv-04504, is before U.S. District Judge Edward Smith. On September 28, 2017, Judge Smith ruled that the Lehigh County seal and flag violate the Establishment Clause of the First Amendment. Lehigh County appealed FFRF’s victory to the Third Circuit Court of Appeals, which heard oral argument on September 7, 2018. FFRF News Release: "FFRF sues Pennsylvania county over cross on seal"
The Freedom From Religion Foundation and the American Humanist Association filed suit over a government-owned cross in the city of Pensacola, Fla. on May 4, 2016. One version or another of the cross, which sits in Bayview Park, has stood for more than 50 years. The city refused to comply with both groups' demands to remove the cross, leaving FFRF, AHA, and four Pensacola residents with no choice but to sue. The lawsuit asks the court to declare that the cross violates the Establishment Clause, and issue an injunction ordering the cross to be removed. FFRF Staff Attorney Rebecca Markert and Legal Fellow Madeline Ziegler represent the plaintiffs, along with AHA Legal Director David Niose and Senior Counsel Monica Miller. The case, no. 3:16-cv-00195, was filed in Florida federal court and sits before Judge Roger Vinson, a Ronald Reagan appointee. 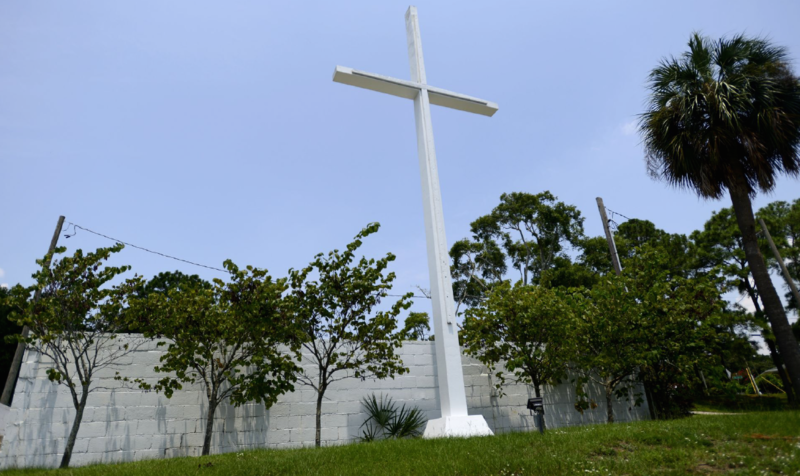 On June 19, Senior U.S. District Judge Roger Vinson ruled that "the Bayview Cross can no longer stand as a permanent fixture on city-owned property.” Vinson ordered the cross removed within 30 days. The ruling came down speedily less than a week after oral arguments were heard on June 14, 2017. FFRF News Release: "FFRF, AHA sue to remove giant cross from Florida park"
In July 2017, the City of Pensacola filed an appeal with the Eleventh Circuit Court of Appeals. On September 26, 2017, the City filed its opening brief. The Becket Fund for Religious Liberty has been retained to assist in the city’s appeal. On September 7, 2018, a 3-judge panel of the Eleventh Circuit Court of Appeals affirmed the ruling from the district court, and found the cross unconstitutional. The City of Pensacola filed a petition for en banc, which would be a review by the full panel of the Eleventh Circuit Court of Appeals on September 28, 2018. FFRF and AHA filed their response to that brief on October 22, 2018. On November 21, 2018, the Eleventh Circuit Court of Appeals sent a notice to the parties in the case notifying them that the petition was being held over pending a decision by the U.S. Supreme Court in a case involving a cross in Bladensburg, Maryland. That case will be heard by the high court in early 2019. In addition to requesting a rehearing by the full court of the Eleventh Circuit, the City of Pensacola also filed a petition for writ of certiorari on September 17, 2018. FFRF and AHA filed the brief in opposition on November 19, 2018, and the City filed a response on November 21, 2018. The Court set it for conference on December 7, 2018, but took no action on the petition. It will likely be re-listed for conference in 2019. The Freedom From Religion Foundation renewed its challenge against the IRS U.S.C. § 107 in a federal lawsuit filed on April 6, 2016, in the Western District of Wisconsin. FFRF Co-Presidents Annie Laurie Gaylor and Dan Barker brought suit against Jacob Lew, U.S. secretary of the treasury, and John Koshkinen, IRS commissioner. Treasury Secretary Steven Mnuchin was substituted as a defendant upon taking office. The lawsuit challenges the clergy housing allowance, which permits clergy to be paid partly through a housing allowance which is subtracted from taxable income. Rep Peter Mack, the sponsor of the 1954 law, argued that ministers should be rewarded for "carrying on such a courageous fight against this [a godless and anti-religious world movement]." The FFRF couple, who are married, are being paid in part by FFRF through a housing allowance. Their request for a housing allowance refund for the year 2012 was denied by the IRS. Anne Nicol Gaylor, president emerita, requested a refund which was not received prior to her death last year. Her son Ian Gaylor is also a named plaintiff representing the Anne Nicol Gaylor estate. FFRF asked the court to rule the provision unconstitutional because it provides preferential and discriminatory tax benefits to ministers of the gospel. The section "directly benefits ministers and churches, most significantly by lowering a minister's tax burden, while discriminating against the individual plaintiffs, who as the leaders of a nonreligious organization opposed to governmental endorsements of religion are denied the same benefit." Clergy are permitted to use the housing allowance not just for rent or mortgage, but for home improvements, including maintenance, home improvements and repairs, dishwashers, cable TV and phone fees, paint, towels, bedding, home décor, even personal computers and bank fees. They may be exempt from taxable income up to the fair market rental value of their home, particularly helping well-heeled pastors. On Oct. 6, 2017, FFRF once more made history by winning its challenge of the housing allowance in federal district court. Mnuchin and several intervening churches appealed the case to the Seventh Circuit Court of Appeals. Gaylor v. Lew has appellate case numbers 18-1277 and 18-1280. FFRF News Release: "FFRF renews David vs. Goliath IRS challenge"
Amicus Brief by State of Wisconsin et al. Amicus Brief by ECFA et al. The Freedom From Religion Foundation filed a federal lawsuit on February 25, 2016, challenging the remove of its approved Bill of Rights "nativity" display from the Texas State Capitol by Texas Governor Greg Abbott. FFRF had a permit and a legislative sponsor for its display. Abbott, as chair of the Texas State Preservation Board, ordered the display taken down only three days after it was erected on Dec. 18, 2015, lambasting it as indecent and mocking and contributing to public immorality. The whimsical exhibit, designed by artist Jake Fortin, commemorates the "birth" of the Bill of Rights (which was adopted on Dec. 15, 1791), depicting the founding fathers and the Statue of Liberty crowded adoringly around a manger scene containing the constitutional document. FFRF placed the display to counter a Christian nativity display placed at the Capitol in 2014 and 2015. The display also featured a sign celebrating the Winter Solstice. In its complaint, FFRF charged that Abbott and the other defendants violated the free speech, equal protection, and due process rights of FFRF. FFRF also charged that Abbott's action was motivated by animus toward FFRF and its non-theistic message, following "a history of hostility directed at FFRF" by Abbott. The complaint asked for Abbott to be held personally liable for his actions in censoring FFRF's speech. On October 13, 2017, Judge Sam Sparks ruled that the State Preservation Board violated FFRF’s free speech rights when it removed FFRF’s display from the Capitol as a matter of law. FFRF then voluntarily dismissed its other, unresolved claims in order to secure a final judgment against Governor Abbott and the Board, which was entered on June 19, 2018. Abbott appealed the district court's ruling to the 5th Circuit in July 2018, where he argued that the district court entered an impermissible declaration that doesn't properly constrain the Board's future conduct. Abbott did not challenge the district court's ruling that he and the Board engaged in viewpoint discrimination by removing FFRF's display. FFRF filed a cross-appeal, arguing that it is entitled to an injunction and that the Board's "public purpose" requirement is unconstitutional on its face. The arguments on appeal are now fully briefed and the parties are awaiting oral argument. FFRF is represented by Associate Counsel Sam Grover and Senior Counsel Patrick Elliott in the case, with attorney Rich Bolton of Boardman and Clark LLP serving as litigation counsel. The case currently before the 5th Circuit is Appeals Docket # 18-50610. The Freedom From Religion Foundation, together with Americans United for Separation of Church and State, the American Civil Liberties Union, and the American Civil Liberties Union of Florida, filed a federal lawsuit on July 7, 2015, challenging censorship of nontheists by Brevard County (Fla.) Board of County Commissioners. The lawsuit asserts that Brevard County's persistent rejection of atheists, humanists and other nontheists who want to deliver solemnizing messages to start meetings violates the U.S. and Florida Constitutions. The plaintiffs in the case include the Central Florida Freethought Community (a chapter of FFRF) and its chair David Williamson; the Space Coast Freethought Association and its president Chase Hansel; the Humanist Community of the Space Coast and its president Keith Becher; and Brevard County resident Ronald Gordon. Litigators include Alex Luchenitser and Legal Fellow Joshua Hoffer at Americans United; Nancy Abudu and Daniel Tilley of the ACLU of Florida; and Daniel Mach of the ACLU Program on Freedom of Religion and Belief; and FFRF Senior Staff AttorneyRebecca S. Markert and Staff Attorney Andrew L. Seidel. The case, Williamson v. Brevard County no. 6:15-cv-01098-JA-DAB, has been assigned to Senior District Judge John Antoon, a Clinton appointee, in the U.S. District Court for the Middle District of Florida, Orlando division. On September 30, 2017, Judge Antoon struck down the Brevard County, Fla., Board of County Commissioners’ exclusion of nontheists from giving pre-meeting invocations ruling in the plaintiffs’ favor. On November 13, 2014, FFRF filed a lawsuit in the Central District of California, Eastern Division, against the Chino Valley Unified School District Board of Education, whose meetings “resemble a church service more than a school board meeting.” There was such an outpouring of support that FFRF amended its complaint on December 15, adding 18 plaintiffs, for a total of 22. All the plaintiffs are families with students in the school or school employees who have had the prayers foisted on them. School board meetings open with a prayer, and often include bible readings and proselytizing by board members. Board President James Na injects Christianity into many of his official statements, FFRF's legal complaint notes. At one typical meeting, Na “urged everyone who does not know Jesus Christ to go and find Him,” after which another board member closed with a reading of Psalm 143. Students often attend the meetings to receive awards, speak about issues affecting their schools, attend disciplinary hearings and do performances. Student attendance is mandatory in some instances, and a student representative is a member of the board. FFRF is represented by Attorney David J.P. Kaloyanides, who won a lawsuit in February on behalf of the American Humanist Association, which stopped the city of Lake Elsinore, Calif., from building a war memorial depicting a soldier kneeling before a Christian cross. FFRF Senior Staff Attorney Rebecca Markert and Staff Attorney Andrew Seidel are co-counsel on the case. The complaint asks the court to declare the board's religious practices unconstitutional under both the federal and state constitutions and to permanently enjoin the board from any further school-sponsored religious exercises. U.S. District Judge Jesus Bernal, an Obama appointee, is handling the case (Case No. 5:14-cv-02336). On February 27, 2015, CVUSD retained new counsel, the Pacific Justice Institute. FFRF filed a motion for protective order to keep the plaintiffs' identities confidential and protect them from retribution. Pitzer College professor Phil Zuckerman, the foremost expert on secular demographics and sociology, offered testimony to support FFRF's motion. PJI opposed the protective order initially, then changed course and stipulated to the pseudonyms. The court granted the plaintiffs' request and ordered that pseudonyms be used from the case. FFRF adds 18 plaintiffs to school board prayer suit in Chino, Calif.
FFRF sues praying school board in Chino Valley, Calif.
FFRF and the other plaintiffs moved for summary judgment and submitted a memo to support that motion on Sept. 28, 2015. Plaintiffs argued that the legislative prayer exceptions in cases like Marsh v. Chambers and Town of Greece v. Galloway do not apply in the school context. Instead, the court ought to analyze this case as it would any other school prayer case. Defendants opposed this motion, but Plaintiffs had the final say in their reply. On October 2, 2015, the defendants made a cross-motion for summary judgment, which plaintiffs opposed. In November, 2015, the Court ordered additional briefing on the issue of standing, raised by the defendants. FFRF submitted a supplemental brief in support of standing to the court at the court's request. The defendants objected to this submission, even though they were able to reply and even the court asked for the briefing. On February 18, 2016, the Court ruled in FFRF's favor, finding that "permitting religious prayer in board meetings, and the policy and custom of reciting prayers, Bible readings, and proselytizing at board meetings, constitute unconstitutional government endorsements of religion in violation of plaintiffs' First Amendment rights." The school board voted to appeal the decision to the Ninth Circuit Court of Appeals in a controversial 3-2 vote at a contentious school board meeting. The defendants filed their official notice of appeal on March 16, 2016. On March 31, the court ordered the district to pay more than $200,000 in attorney's fees and costs. On July 25, 2018 the 9th U.S. Circuit Court of Appeals ruled against prayer at public school board meetings. In August, the school board asked the entire Ninth Circuit to rehear the case in a petition for rehearing or rehearing en banc. FFRF opposed that motion in its September 17, 2018 reply brief.